My Delhezi Bichir was previously more than happy to eat beef heart, silver sides, and black worms, but recently has gone on a hunger strike... I was giving him the occasional treat of live saltwater crabs that I had been catching out of my saltwater tank, so maybe that spoiled him into only wanting to hunt? fish are dumb enough to come snag a piece. He keeps lurking to try and catch more fish. I've tried offering market shrimp, scallops, crab meat, silver sides, beef heart, blackworms, live earthworms, and Massivore pellets, but he's snubbed them all. Rainbow are all full grown and not at risk of being eaten, but the others were restocks after I had a problem with an Opaline Gourami killing half my tank (who's since been removed)... I got the largest I could find to replace, but no one sells Rainbows or Congo Tetras larger than 2-3"... I knew it was a risk, but this guy's been so mellow and easy to feed until recently that I was hoping it would work. Is there any way to convince the Bichir to go back to non-live foods, or do I just need to cut my losses and pull the Congo Tetras now? isolated him in a spare 20g long bare bottom tank for a short time to keep him away from the tetras until he takes food again? Or would he just go back to his old tricks the moment he had fishy temptations again? He managed to snag a couple of my Congo Tetras that didn't quite grow fast enough to stay out of "bite size" range. Ever since then, he's trying to use the beef heart as bait for the other fish. He'll literally sit with his nose practically touching it while lurking under the driftwood or Amazon Sword leaves and just waits to see if any of the other fish are dumb enough to come snag a piece. He keeps lurking to try and catch more fish. I've tried offering market shrimp, scallops, crab meat, silver sides, beef heart, blackworms, live earthworms, and Massivore pellets, but he's snubbed them all. were restocks after I had a problem with an Opaline Gourami killing half my tank (who's since been removed)... I got the largest I could find to replace, but no one sells Rainbows or Congo Tetras larger than 2-3"... I knew it was a risk, but this guy's been so mellow and easy to feed until recently that I was hoping it would work. or do I just need to cut my losses and pull the Congo Tetras now? Maybe if I isolated him in a spare 20g long bare bottom tank for a short time to keep him away from the tetras until he takes food again? Or would he just go back to his old tricks the moment he had fishy temptations again? Hello and thank you for always having such great answers! I apologize in advance if the answer to my question can be found somewhere here. I currently have a 55 gal with two juvenile Senegal bichirs (5in or so) and a convict cichlid. They have lived together since they were very small and have got along well. My convict is generally very docile and previously was bullied by other cichlids, so he and the bichirs enjoy a peaceful life. My question is, what would an ideal food be to offer to both species? I have typically fed them frozen bloodworms which they all enjoy and seem to thrive on, but the diet I've seen you recommend for bichirs seems much more varied and likely better. seen and they do all appear to enjoy the thrill of the hunt... second part to my long winded question- I recently started a tank of feeder guppies separately and they have begun to breed. I am fortunate that my local pet store has their own breeder tank; the guppies I purchased are definitely more healthy than ones typically seen at big box pet stores. because I have 3 black long finned tetras, 3 black and yellow (not sure if they are guppies or not but in that family) 1 sucker fish, 1 big snail. So I know w/ that many I have to keep the levels right for them all and I try hard to do that constantly. I live right next door to a PetSmart. He was the last addition other than some small minnows for him to eat. Not sure if that is killing him or not but something seems to be wrong with him. He has started swimming funny. Like his head is too small for his body and there is a small dark spot on top of head. That has been a few weeks now but last week started the mess I am in now. he just started swimming crazy flipping and rolling in circles and twirling all over the tank when I would put my hand in to feed him/the others. He does that anytime I get near the tank. Then last night. I thought it was it. he swam all over crazy, and then went to the bottom and just sat there. Before I fed him live fish and bloodworms (freeze dried). Now, it's live fish and shrimp pellets. Is there something specific I should do to keep this one alive that I might not know about? any help would be appreciated, these aren't just fish to me, he's my buddy, they are my pets/my family. When I do water changes I only do about a 30% water change and vacuum sand. Is sand bad to have? should I get the bigger gravel? I changed to sand when I got him because they said he would like to dig and hide. But, Will start working on all of that. I have smaller tank I can get him to, and will start on the other food and stop the pellets. If this does not work, how do I get him/tank tested for the parasites/disease? I know that is not the actual name, but that is what the pet store called it. He is called Buddy now. it is the lighter color silver/yellowish. He is big now, about 12 inches maybe an inch thick. I would say, maybe a little smaller. I know w/ that many I have to keep the levels right for them all and I try hard to do that constantly. I live right next door to a PetSmart. He was the last addition other than some small minnows for him to eat. Not sure if that is killing him or not but something seems to be wrong with him. He has started swimming funny. Like his head is too small for his body and there is a small dark spot on top of head. That has been a few weeks now but last week started the mess I am in now. he just started swimming crazy flipping and rolling in circles and twirling all over the tank when I would put my hand in to feed him/the others. He does that anytime I get near the tank. <There is of course a disease called Whirling Disease that affects (mostly) salmonids such as Trout. It isn't proven to occur among tropical fish though I suppose coldwater species like Minnows might introduce it. More likely though we're looking at something else, difficult to pin down. Check firstly environmental parameters. Many fish go loopy when stressed; the classic example is what happens when too-cold water is added to a tank of cichlids. They lose control. Fix the conditions and they get better. fighting like he was out of energy. He is not bloated in anyway like I have seen online. Am I feeding him the wrong thing? Before I fed him live fish and bloodworms (freeze dried). Now, it's live fish and shrimp pellets. <Please may I also stress that with carnivores there's always the problem of thiamin (vitamin B1) deficiency. Can cause all sorts of symptoms including nervous system problems. Shrimps, prawns and similar crustaceans and most fish from the Cyprinidae family (minnows and goldfish for example) are the two main food groups that cause thiamin deficiency because they contain an enzyme called Thiaminase that breaks down this vitamin. It's a slow to develop problem that might not cause ill health for months, even years, but it is likely a very common reason for predatory fish mortality. Is there something specific I should do to keep this one alive that I might not know about? any help would be appreciated, these aren't just fish to me, he's my buddy, they are my pets/my family. I have a question. I have a smaller tank he is in but Im having problems w/ my little heater. Is it safe to put him back in big tank? Or do I need to keep him separated while doing the medication? Will get the medication today. Just in case. I honestly do not know what it could be. maybe a combo ? I have fed him minnows over the last few weeks. I think this is what is doing it. That and when we took him out to put in other tank, looks like a dark grey dot on top of head, might even be a hole? What do I do about that? <Pray to the fish gods! More seriously, at this point, get the Bichir settled and feeding again. Is he still spinning about? That's the key problem. Bichirs do suffer physical damage quite easily (jumping to aquarium hoods and getting burned on heaters without plastic heater guards) but such damage heals readily if they're feeding and in good quality water. Ok. I have him in a smaller tank so he can't thrash around as much. He does sometimes, but nowhere near as much. i might just put him back in other tank so he is in good levels of water. on him will see how he turns out. Hopefully he will start eating better soon- I took minnows out tank and only feeding him bloodworms for right now. I have a juvenile Ornate Polypterus, approx. 3 inches, which was housed for the past three months in a 29 gallon by itself. pH. The Nitrates, however, tested at 80ppml. prime, emergency water changes every 2-3 days of 1/4 of the tank's volume. The Nitrates are holding at 80ppml. I then tested my tap water and it tested close to 20ppml. The head guy at my fish store, who is also an eel keeper, both fresh and salt, recommended getting the Polypterus into a hospital tank ASAP. I drained my 10 gallon hospital tank, and refilled it with filtered water from the aquarium store, let it run and heat up to temp for awhile and then tested the Nitrates. It tested at 20ppml, so I immediately started acclimating the eel in a bucket with an airline tubing drip for quite awhile before putting him in. He is responsive and seems fine, not breathing heavily or anything, but still won't eat after 24 hours of being in the tank. I am very worried that it is simply going to starve itself to death. I have longtime experience in keeping these fish, and have never had an issue like this before. In fact, I have a large one in a 72 gallon that is quite healthy. Very confused and desperate to save it. in use for several years, 7 I believe. It as well had high Nitrates before putting the fish into it. It had been kept for a few months as just a hospital tank and hadn't had an occupant for awhile. It tested at 80 as well. Now it is testing at 10/20. Hard to tell with the close colors on the API kit between those two numbers and is holding. He seems more responsive as far as coming up to me when he sees my hand outside the glass, and he is moving around a bit more, switching laying spots frequently, but he will not eat. I put 3 Ghost Shrimp in there with him just to have some kind of food source at all times that was not rotting. If he doesn't eat the Krill after a bit, I remove it so not to add to the problem. It's refreshing to hear that they can go so long. He also doesn't seem to be wasting away physically. I guess I will just keep trying and hope for the best? I am finding it challenging to bring the levels down on the his former tank, but am keeping at it diligently as I would like to eventually return him to it until he grows out of the tank. Thanks for the links as well!!! I have previously owned bichirs, and currently own a delhezi bichir and Senegal bichir (separate tanks). in my third tank, I have recently gotten a baby bichir. he looks like a saddled bichir but I am not sure. (see attached pictures). 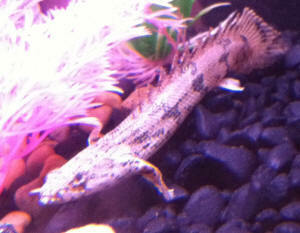 His personality is very similar to my first bichir, which I believe was saddled. He is very energetic, and likes to sit on top of the plants, or squeeze between the heater and the tank wall. He looks like he is hunting, but he is in there alone. Can you identify him for me? Also, what would be a good diet for a baby bichir? I'd prefer not to handle raw meats/fish. does the same go for feeder minnows/tuffys? Are there any frozen foods that would be good for him? He doesn't seem too into pellets, and the store where I purchased him said he had quite a few fish. I just want this little guy to have the best life he can, and I'm willing to do almost anything to make him happy, he is already a very special fish. that I got along with 2 Iridescent Sharks and two Balas and a large Pleco. <In 55 gallons! Not a chance. Iridescent Sharks (Pangasius hypophthalmus) get to at least 75 cm/22 inches in captivity. They also grow extremely rapidly. Do please use Google and see how large these fish get. The photos will astound you! Bala Sharks (Balantiocheilos melanopterus) get to a good 30 cm/12 inches long, and require a good 55 gallons PER specimen. They were all in a 55 gallon tank when I notice all the fish but my Dinosaur Bichir got Ick. I got the tank cleared of Ick and the next week one of the Iridescent Sharks had an eye missing. I watched the tank closely and didn't see and fish fighting however all the fish but the Dinosaur Bichir came down with a bacterial infection. Finally got the infection under control and then noticed that my Dinosaur Bichir was eating the fins of my sharks. I switched the food to bloodworms hoping this would help not only with her trying to eat my other fish but with tank water clarity. I have tried for 6 months to get the tank clear and it seems like it just wont balance out. I have live and fake plants and plenty of hiding spots. I decided that maybe the common denominator was my Dinosaur Bichir so I took her out and put her in my 40 gallon tank which I new everything was balanced and has a bushy nose Pleco in. Within 2 days my 55 gallon tank is sparkling clear however the 40 gallon is horribly cloudy. Why do my tanks do this is there something wrong with my Dinosaur Bichir ? the ph levels are spot on however the nitrate/nitrite and ammonia levels always are high in the tank with the Dinosaur Bichir. Also my Dinosaur Bichir seems to prey on the injured or weaker fish even though she is eating plenty of blood worms, should I get her some feeder fish? Great site, I wish I had found it two days ago. I have a cycled 90 gallon tank that tests out very well (according to a friend and the LFS). Its a sand substrate with lots of plants, rocks and a great filter good for 150 gallon tank (I cant recall the name but its top of the line, recommend by a long time aquarium enthusiast). <OK, but do take the recommended tank size for filters with a spoonful of salt. They're based on the best case scenario, i.e., small, guppy-sized fish, not big predators. In the case of a 60 cm fish like an Ornate Bichir, you'd be looking -- at minimum -- for a filter rated at 8 times the volume of the tank in turnover per hour, i.e., 8 x 90 = 720 gallons per hour. In it I have: two 5" Ornate Bichirs, two 7" Rope Fish and plan on two African Leaf Fish. There is a hockey sock of Guppies, Tetras and Cory's as well (tank cycling crew). I want a single elephant nose (but am intimidated by their difficult reputation) or a Ghost Knife Fish as well. <You are wise to be prudent. Neither of these species makes an obviously good companion of Bichirs of the type you're keeping. Polypterus ornatipinnis is a big, aggressive species usually kept only with robust tankmates. Elephantnoses are extremely fussy feeders that need to be kept in a tank with soft sand (never gravel) and they should never be forced to compete for food, even with Corydoras. That path leads to starvation. Will the Bichirs fight? I just found out that they can get territorial. Any and all advice is more that welcome. Its been awhile since I've sent any e-mails for your advice. I'd like to say thanks for your useful tips in your replies. For a beginner like me and my sis who had no experience in keeping Ornate Bichirs or Plecos, a year has passed and all of them are doing fine, the Bichir reaching nearly a foot long. The reason for this e-mail is for some advice regarding further info on Ornates and Plecos. Firstly, like the large Ornate I have, I was once again given 2 more approximately 2-3 inch Ornates together with a 20 gallon tank. Apparently the owner did not want to risk these Ornates dying as a quite a handful of fish they kept in the past, so they handed it over to me. I am aware the tank isn't big enough and they will eventually outgrow it, but for now they have ample space to swim about and I added two 6 inch PVC pipes for them to hide. The last time I asked, you advised not to keep more than 1 Ornate together unless the tank was really big and many have said that as well due to their habit of biting. But some fishkeepers I've asked have said otherwise and they can be kept together. Both seem comfortable with each other at the moment though. Thoughts on this? Secondly, just some further info on Ornates. How long do they live? I heard 10 years but many have said they don't know. Are there sub-species of Ornates? Once read a magazine that recognised 4 sub-species that grows to different lengths. And about feeding them like the last time I inquired, I successfully fed the 2 small ones pellets. But the foot long Ornate seems to be Â…rather fussy. Most of the time it opts to starve itself till we give it fish (some 5 days at a time!) and were not sure if it eats the pellets we feed it. One person advised me to starve it till it accepts pellets since most do that. Is this a good tactic? How long can an Ornate go without food? Will it remain defiant on its hunger strike till it perishes? I certainly don't want it to die because it is picky about what it eats! And finally, how do you tell about male and females among Ornates if you're given a random specimen? That's all for Ornates. Finally, just a few questions regarding a certain species of Pleco: The Bristlenose/Bushy-Nose Pleco. I was planning on getting one or two to put it with the 2 small Ornates, but not before I sort a few things out before deciding. The profile on WWM says it tolerates alkaline water, but can it tolerate more acidic conditions as my tank water tends to get acidic instead of basic? And because of its small maximum size as opposed to the potentially large Ornate Bichir, will they become compatible or will the Bichir ï¿½bullyï¿½ it around? Also, is it as hardy as common Plecos (I have leopards, I think)? The Bristlenoses are rather expensive and I don't want them to die if I were to purchase them. Also, how long do they live? I apologise for the unusually lengthy e-mail. Take your time in answering it and thank you very much. Dear Crew, I am Avaneesh from Bombay, India. I have figured out that your site is actually quite helpful. most part sleep at night time. Personally, I'd be watching the Aequidens rivulatus like a hawk! These are very mean fish, and Senegal Bichirs are docile, even gentle, fish that are easily bullied by aggressive cichlids. I have seen cichlids bite all the fins away from Bichirs! You may find keeping the Bichir in its own 125-litre aquarium much more satisfactory. thank you for your reply..I have tried earthworms and they have really encouraged its eating..Thanks a lot!